In my recent post, I wrote about a famous "wet spot" on Waikiki Beach in Honolulu, Duke's Barefoot Bar. After writing that post, I thought I should share the amazing story of "Duke", and who he was. 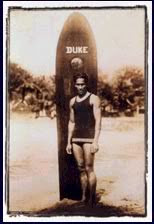 Duke Hahanamoku was Hawaii's most famous citizen and the "Father of International Surfing". Born in Honolulu in 1890, he grew up in Waikiki playing in the ocean. He won his first Olympic gold medal at the age of 21, and continued to represent the USA in the Olympics for over 20 years. Although Duke won medals in swimming, he loved to surf for enjoyment and provided awareness to the sport of surfing. Duke's tall, athletic stature and striking good looks led him to the Hollywood film industry, and he appeared in over 28 movies. Besides his athletic ability and movie star looks, Duke was also a charming man who had a genuine concern for others and was humble in his victories. He was always gracious and never capitalized on his fame. In his golden years, Duke became Hawaii's Ambassador of Goodwill and Honolulu's Official Greeter. During 1966, at the age of 76, he was the first person inducted into both the swimming and surfing Halls of Fame. Duke passed away on January 22, 1968. He was remembered by Congress and many others as a symbol of Hawaii, and as a man of many accomplishments. 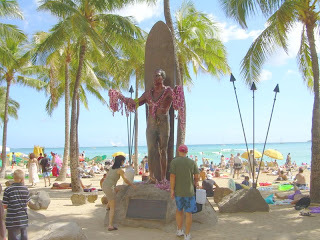 Today, statues honoring his excellence in swimming and surfing and his role as Ambassador of Aloha are well-visited shrines in California, Australia, France, Hawaii, and elsewhere. In Hawaii we greet friends, loved ones or strangers with Aloha, which means with love. Aloha is the key word to the universal spirit of real hospitality, which makes Hawaii renowned as the world's center of understanding and fellowship. Try meeting or leaving people with Aloha. You'll be surprised by their reaction. I believe it and it is my creed.